I’ve seen the headlines. There are going to be some big names at the running back position wearing new uniforms in 2017. Adrian Peterson to New Orleans. Marshawn Lynch to Oakland. I respect both of those guys for pursuing new opportunities. As much as fans are crazy about their respective teams, players are crazy about the game. What they’re each doing is one of those things that shows fans of the game that the players really do love the game. If they didn’t, they’d both hang it up for good. They’re both taking a chance by going somewhere different. I’ve certainly been where those two are now before. When you spend the first several years of your career with one team, like I did with the Rams and like Adrian did with Minnesota, you’re respected league wide, and everyone related to that team knows you: the media, the fans, the coaches and your teammates. Everyone. So there’s a culture shock when you start over in a new place. That’s the first thing you have to deal with when you go to a different franchise. Every team has its own way of doing things. So even though you’re a big name or a star in the NFL, it’s almost like you’re an outsider. It’s very humbling at first. But the thing about all locker rooms is that if you perform and you can be accountable, guys will respect you. Still, you have to learn the new schedule. You have to learn new coaches. Even the way teams work out might be a little different. Every new guy you meet has his own personality and teams also have their own guys that they drafted and groomed themselves, and some of them you are there to compete with. When I hit free agency for the first time in 2013, I was truly surprised by the recruiting process. I was shocked by how much people lie to you. You’re told one thing, but once you wind up in a new place, things change. You realize that what you signed up for isn’t necessarily what you’re going to get. We know that the bounce of a football can change the outcome of a game or a season. If you’re someone that a team looks at as a one-year signing, someone who is supposed to bring interest to the team and sell tickets, and then the team goes in the opposite direction then you thought it would, let’s put it this way: You’re the new guy. You don’t get the benefit of the doubt. But there are some benefits to starting over with a new team. You get a chance to prove yourself all over again. Not only to your old team or your new team, but to the league itself. The other thing is that, if you stay on one team and never win a Super Bowl, you question yourself. You wonder what would have happened if you’d gone somewhere else. There’s this stigma in the NFL that once you hit 30, especially at the running back position, your productivity goes down. There’s a lot more to it than that. The average fan doesn’t get a chance to see that. It’s the way you’re used. It’s the way the playcalling happens. It’s where you fall in the priorities of the team. Maybe there’s some young stud, and the team prefers to put the game in their hands. These guys are going to have to overcome that. When you’re an older running back, you have a sense of pride. You have a reputation for always coming up with the big play, and making something out of nothing. You can want to go to a run-oriented team that believes in that philosophy. We’d all love to run behind the Dallas Cowboys offensive line, but that’s just not how it goes for everyone. But if they’re not interested, they’re not interested. You have to make hay with what you’ve got. It could be that the only teams that want you are pass-happy and just want a threat at the running back position when they go three or four-wide. But if you go to a team where the offensive line isn’t built for run blocking and running isn’t their forte, it can be very frustrating. Defenders are always behind the line of scrimmage and you can’t get started. You need to have a different mindset about how you’re going to run the ball, and it depends on how you want to handle it in the locker room and in public. You want to say, “I’m not losing a step,” but you don’t want to point the finger at anyone else—especially if you’re the new guy in the locker room. You don’t want to become the cancer. It’ll be interesting to see how each guy is utilized in his new home, especially Adrian down in New Orleans. Drew Brees is a spread-it-out, throw it down the field kind of guy. That’s their philosophy as an offense. He and Mark Ingram will be lucky if they get 25 carries combined. They’ve got a Hall of Fame quarterback who is a Super Bowl champion and MVP winner. They’re going to throw the ball a lot. Having Adrian gives them insurance at the position, but there aren’t any teams that run the ball 40 times a game anymore. That’s going to be tough for AP. Like myself, he likes to be in the flow of the game and get a lot of carries. 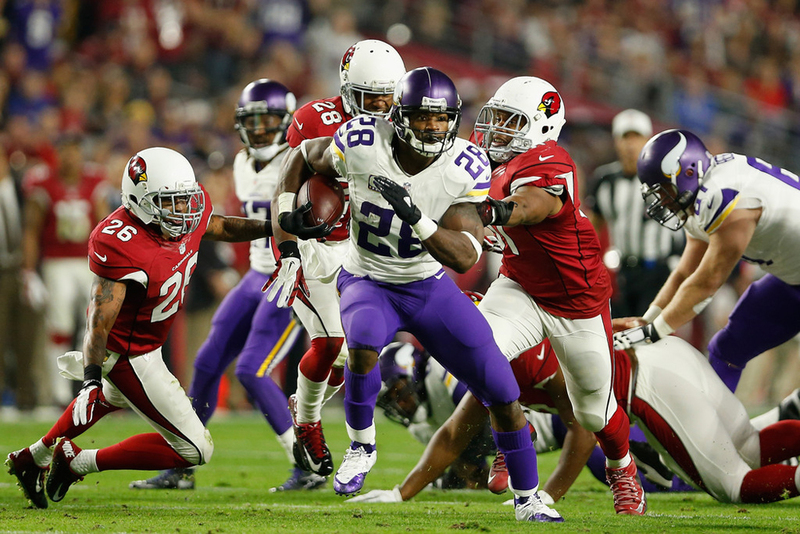 For New Orleans, Adrian brings a different level of credibility at the running back position. 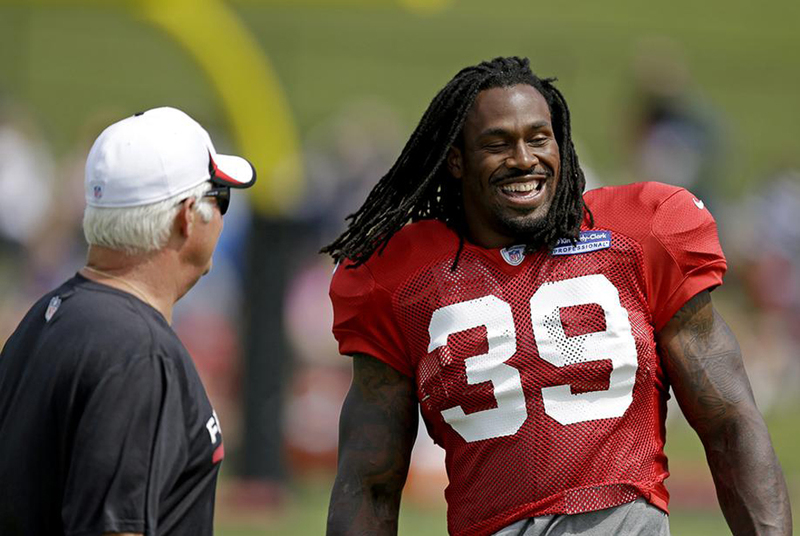 Between him and Mark Ingram, there’s not a down that the defense can take for granted. Typically, when a defense sees a backup come in, they feel like that’s a down they can take off against the run. But both those running backs are a legitimate threat every down—if not a home run threat, thEn at least a first down threat. The other thing that Adrian brings to the team is greatness. Not everybody gets to play with a future Hall of Famer. When guys see his work ethic and intensity up close and personal, you hope that becomes infectious and rubs off. 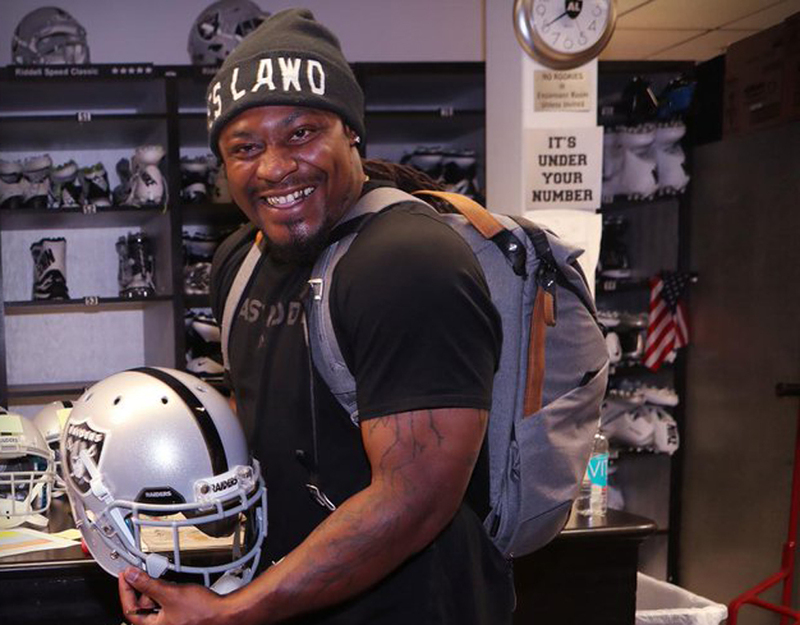 Marshawn going to Oakland makes more sense to me on paper than the Saints signing Adrian. It’s a great signing for his hometown team, the Raiders. He can be the heart and the muscle behind that Oakland offense. He’s a great running back and a good fit with that team’s personnel. It also makes sense for them from a marketing perspective, since it will be one of the last years the Raiders are in Oakland. It puts a good story on something that’s not so pretty because they’re headed to Las Vegas. No team has ever announced they’re moving and not moved the same year, so this should at least make the season more palatable for Oakland fans. As far as him coming back after a year away, I speak from experience when I say that being away from football makes you remember how much you love the game. It also makes you hungry. I remember when I stayed out until midseason and then went to the New England Patriots a couple years ago, it was one of those things that made me feel like a kid again. Football wasn’t a business for me anymore. That last season in New England was about enjoying not only being in the postseason, but the locker room setting, feeling like a young player who was part of a team again. You knew a lot of teams would be interested in Marshawn if he decided to come back. He’s one of the league’s favorite players. He’s always going to be in the hearts and minds of Seahawks fans, but now he gets to go out on his own terms, playing for his hometown team. That’s pretty neat. I don’t have a similar comeback to announce, but I do feel in my heart and my body that I could still be an effective contributor to a team in the National Football League. I think I could bring leadership qualities some teams are lacking. I’m also a guy that could move the chains, and bring consistency to a team’s rushing attack. But I also understand that for a veteran guy on a roster—especially running backs in year 13, which would be my situation—for someone like me, it would be more about mentoring, about being part of a playoff run or a championship run, than it would be about a contract or stats. That’s my perspective. When I launched #SaveTheRunningBack a few years back, the idea was to bring attention to a group of players at a position that I think has been neglected and underappreciated over the last several years. More and more teams are centered on the quarterback. Coaching staffs make their names by putting points on the board. Defenses can’t be as aggressive with receivers, so throwing the football down the field is a lot easier than it once was, too. Those days of the running back being the star of the show, carrying a franchise and never coming off the field are gone for now. It may take change in how the rules are officiated and how coaches call plays to bring that back. But there is some hope. Last year we had a running back, Ezekiel Elliott, taken in the Top 5 of the NFL Draft for the first time in several years, and he had a phenomenal season. Now there’s a chance we could see two or three come off the board in the Top 10 this year. That would be great to see. Any time I see running backs come off the board in the Top 10, it does my heart some good. As for those guys in the draft this year. 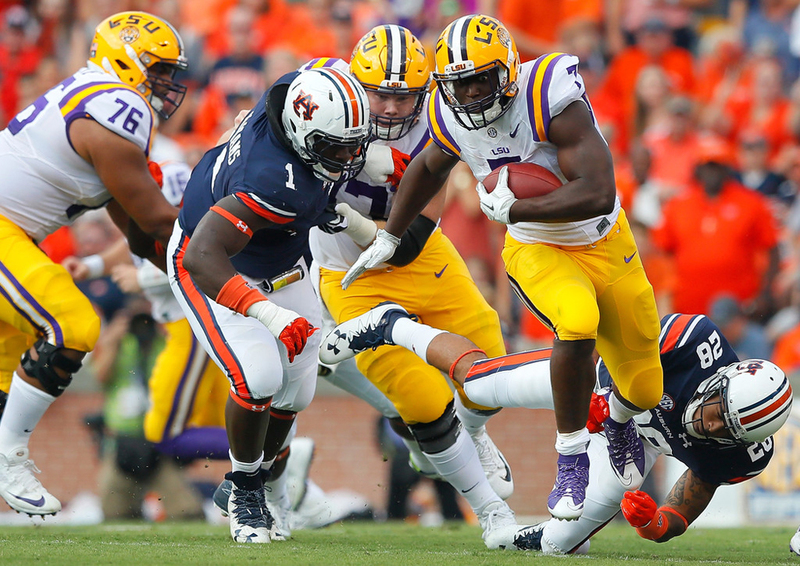 I’ve watched Leonard Fournette a bunch and he actually reminds me of myself a lot. He’s a big-framed guy, six-feet tall around 240 pounds, and runs a 4.4 forty. Those were pretty much all of my tangibles. He’s got really good feet. He can get through traffic and can get skinny between the tackles. Being that big and that agile is pretty special. I love guys that not only run between the tackles, but can be athletic in the open field, too. He can put a move on a guy. And he can run violently, too. If he continues to play the game the way he has, has the right mindset and stays healthy, I think he can be one of those once in a generation guys. That kind of size, speed and agility doesn’t come naturally for a lot of people. I’d love to see him on a team like the Carolina Panthers that already has a veteran running back so Fournette doesn’t have to get thrown into the fire right away. They have a superstar quarterback. They are a run-heavy, pound the football, -in-your-face attitude to that team. I think that really fits him. I’ve also seen a lot of Christian McCaffrey. He’s dynamic. He comes from a football family and he’s a heck of a returner as well as a running back. He catches the ball really well out of the backfield. He’s really versatile. And he seems to have a toughness about him. Kind of reminds me of my former teammate Devonta Freeman in that he’s not a big guy, but he’s tough. It’s about the mindset you have at the position, and Christian has that. He’s a one-cut kind of running back, so I could see him fitting in with San Francisco or Washington because of the blocking schemes and the offenses those teams are set to run. Hopefully, we’re seeing a renaissance at the position and running backs will return to prominence soon. These running backs who are coming up now are very, very talented athletes, and you have to keep a defense honest. The only way to keep a defense honest is to have a legit threat at the running back position. Ezekiel Elliott and LeVeon Bell are two of my personal favorites to watch on Sundays. But it’s going to be really hard for them to climb the record books just because the nature of the game has changed. But the game is always evolving, so what’s trendy now won’t always be that way. It’s going to be fun to watch it continue to evolve. Great Article Steven! I’ve Brenda big fan of yours ever since I was a kid. As crazy as it is, I still catch myself googling your name to see if you have been able to grace another team with your greatness! Was hoping to see you at the Legends of the Dome game in St. Louis. I wasn’t actually able to attend due to military commitments. But when I think of the Rams, I think of St. Louis, and I think of you. You are, hands down, my all time favorite running back! Thank you for all that you’ve contributed to the league and all of the amazing highlights! Here’s to you and hopefully more to come! I wish you were still playing you made Las Vegas family’s proud. Great read. Followed your career from the Pac-10 days and throughout your great career with the Rams, Falcons and finally the last pit stop in New England. You were a great player, and wish you nothing but the best and continued success in retirement.